Polka Dot Celebrations is a Gurgaon based party planning company that organizes stylish kids birthday parties, baby showers and baby arrivals. Whether you’re hosting a small party at home or a party at a banquet hall Polka Dot Celebrations is the perfect choice for planning your special occasion. A one of its kind Birthday Planners in Gurgaon. If you are looking for crafty decor, dessert tables, eco-friendly decor, minimalist decor, few balloons, quirky decor or food styling then Polka Dot Celebrations is your go-to. They are the best birthday planners in Gurgaon. Polka Dot Celebrations caters to parties all over in Delhi and Delhi-NCR. Whether you’re located in Gurgaon, Noida, South Delhi or North Delhi, Polka Dot Celebrations can help you plan a great party. 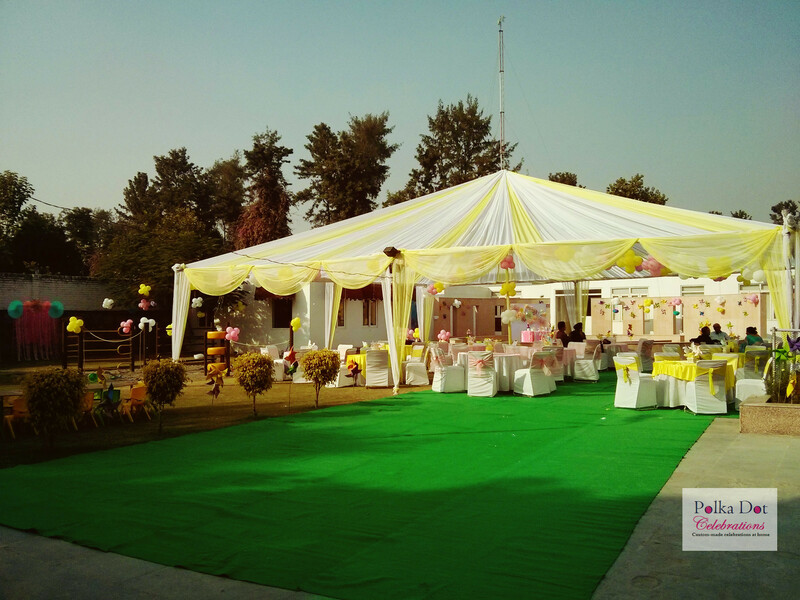 There are many birthday planners in Gurgaon and Delhi, but Polka Dot Celebrations tries to offer something exclusive and customized for its clients’. What is Polka Dot Celebrations? Every party is well thought out and customized to the needs of the client.If you’re looking for Birthday planners in Gurgaon that offers Innovative Ideas, Customized Decor, Professional Service, Flawless Execution & Stress-free party planning, then Polka Dot Celebrations is the right birthday planner for you! The idea and motto behind Polka Dot Celebrations is to change the way people style their parties. A themed party does not need to be about cutouts and balloons. A theme can be conveyed by just using the right colors, elements pertaining to the theme and quirky concepts and visuals. That is the aim behind Polka Dot Celebrations. So if you are looking for a professional Birthday Planner in Gurgaon then you have come to the right place! What is unique about Polka Dot Celebrations? Polka Dot Celebrations aims to create awesome dessert tables with customized backdrop, Polka Dot Celebrations also focuses on Photo booths. This has become a trend of sorts in many parties. But rather than just adhering to huge flexi as backdrops, Polka Dot Celebrations tries to do something different depending on the requirement and budget of the client. If you’re planning your child’s birthday then, call Polka Dot Celebrations at 8800206186. Polka Dot Celebrations, focuses on minimalistic and stylish looking parties. A birthday planner, that focuses on lots of handmade decor and crafty look & feel. Lot of attention is paid on details. Our party styling is affordable and beautiful at the same time. Who says theme parties have to cost you a bomb! So look no further for any other Birthday planners in Gurgaon, just call us soon to make your event memorable! Our specialties are First Birthday Party Decor, Concept Activities as per the theme, Teenage Birthday Parties, Wedding Vow Renewal, Baby Arrival parties, Baby Showers, Christian weddings, Communion Parties, and much more. You can follow us on Facebook & Pinterest as well! Proudly powered by WordPress Experts | Theme: Sugar & Spice by WebTuts.